In the last post I was talking about the random and chaotic nature of cloud shapes and how photography’s frozen images of skies have conditioned how we see skies in paintings. At the moment I am seeing how far I can go portraying skies as we now accept the images, and try and fit this apparent chaos in a traditional landscape painting. In this painting the eye is lead along the bank of the stream, exiting the scene on the right. This ‘weight’ on the right hand side is balanced by more detail in the sky on the left, but keeping this balancing act hidden in apparent random shapes. The plan was to create an inviting world to explore, which the viewer will hopefully find more familiar than a scene with the usual stylized sky. I think there is a limit to how far this can go. I’m reminded of the ‘uncanny valley‘, a term used by the creators of ‘human like’ robots. We are happy with robots which are vaguely ‘human like’. As the robot becomes more ‘real’, a point is reached where we feel a sense of revulsion. It becomes too ‘real’. So it is with how ‘real’ I can make my skies. A sky looking like it was cut and pasted from a photo will cause a sense of revulsion. I have learned a little from this exercise. I like my paintings to be on a ‘knife edge’. I think I will apply this to skies, pushing the shape towards an almost uncomfortable reality. Here is the video of this painting process. Colours used,etc. can be found on the previous post. 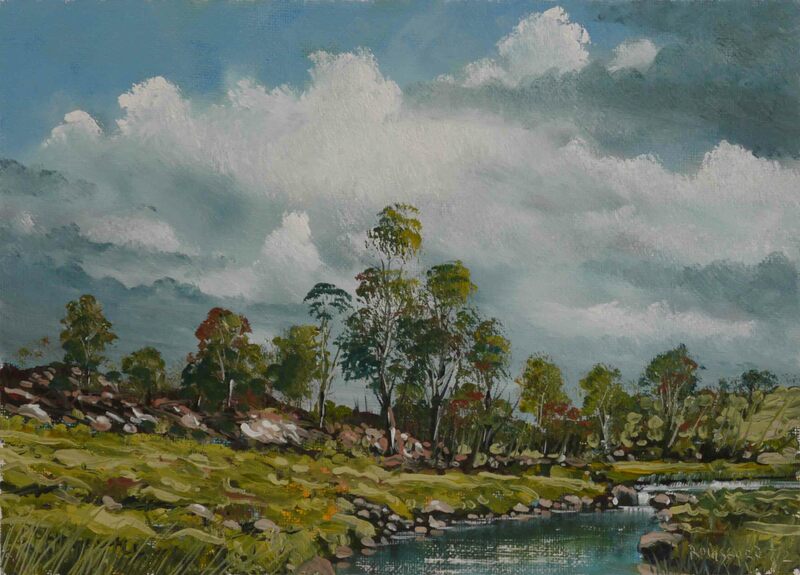 I have just completed another painting for the next post which has a similar sky treatment to this painting. See you then. This entry was posted in Oil Painting and tagged Art, Culture, Education, Inspiration, Irish landscape, Oil Painting, Oil Painting Instruction, Oil Painting Landscape, painting, Painting Clouds, Painting Skies, Pictures, Time lapse painting. Bookmark the permalink.